Other Apple hardware not shown in the picture includes an iPhone 4S, first gen Apple TV, Airport Express, and Airport Extreme base station. Thanks for sending in your great setup Stephen! 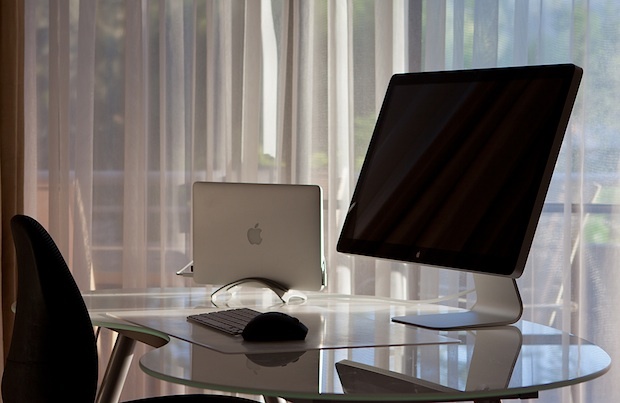 Check out more Mac setups in our archives. Future MacBook Air to Support Two External Displays? Drooling because this is basically my dream setup, but I have a hard time on paying $1000 for a screen. totally agree. Wouldn’t purchase a cinema display (unless it was with a MacPro, rather just get an iMac. Portability is the key, Cant walk or take an iMac around the house or 2 mates houses. plus i looked at the equivalent spec monitor and it was a dell and wasn’t much cheaper forget that! Wow. Looks amazing. Very nice shot, very nice set up. Thumbs up! Some help…. but how do you use a Macbook with the lid closed, i.e. for playing music etc from the Apple Remote app on a phone with the laptop closed over…. I’ve just never run into how to make this possible..!? Lovely desk, best in a while. Very nice setup. Clean, simple and neat. Be proud of this setup. Just drop dead gorgeous. I am aiming for this setup, I just lack the monitor. I am down with it to the point that I have same mouse. That mouse is productivity powerhouse. Highly recommended! Get the monitor its great, i love my setup, only thing i find is that my macbook does get quite hot in clamshell mode when watching flash or data transfer apart from that thanks . As for the mouse, yes i tried the apple mice but way too uncomfortable. So hot and with fan noise… Common? Most beautiful setup i’ve seen here so far. Not too many people have the guts to pay 1000$ for a screen. But that’s the price of perfection i believe. Does anyone know the specs for the White Glass Kidney Bean shape desk? Mainly where can I get one? I liked your setup so much that I just replicated it! Thanks for the suggestion! The only thing “missing” in my view are speakers. I found music coming from the MBA less than satisfactory. Have you added any decent speakers to your setup since it has been unveiled? Would you have any suggestions that would be in line with the esthetic of your setup? I use airplay to my home theatre setup so I have no issue with music or sound when I want it loud. Simplicity and functionality at its best. Cleanest setup I’ve seen. I am thinking of getting the thunderbolt display aswell. @Francois, The thunderbolt display has built in speakers that are decent and way better than the one on the MBA or MBP.